Since I started having periods around the age of 11, I’ve used disposable feminine hygiene products without question or hesitation. Why would I question it? Theyâre individually wrapped, sanitary and totally safe, right? I never thought to question the processes or chemicals used in making them. Then, in my early twenties, I started noticing that my periods were getting heavier and more painful. The doctor told me that hypothyroidism was to blame and put me on thyroid medication. But, even with meds and weight loss, each month was more uncomfortable than the last for the next 5-6 years. At a loss, I decided that having children had changed my body and those changes must just be affecting my cycle. Grin and bear it was my motto. As soon as I switchedâIâm talking the first period here, ladiesâI noticed less severe cramping and a lighter flow. I was amazed. 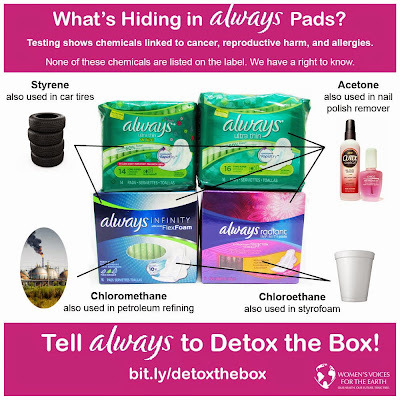 Then, I did more research and saw the results of the Womenâs Voices for the Earth (WVE) Detox the Box campaign. And let me tell youâitâs no wonder we are experiencing a rise in womenâs issues, from more severe monthly discomfort to infertility. Are the chemicals we have unknowingly been putting on and into our vaginas (oh yes, I DID just use the âvâ word!) entirely to blame? No, Iâm sure theyâre not. The chemicals we’ve been unknowingly putting on and into the other parts of our bodies are certainly another piece of the puzzle. But now we can no longer claim ignorance. Women have gotten wise to what weâre using to fuel our bodies. Weâre demanding quality, purity, and transparency from the food industry. Shouldn’t we be doing the same for personal care products? I’ve linked to WVE’s Detox the Box campaign above so you can review all the information for yourself. Women have long fought for the right to choice and power over our own lives and bodies, and now is the time to exercise that right. Whatâs stopping you?